Glass, plastics, bitumen, asbestos, paints, distemper and varnishes are some of the miscellaneous materials used in building constructions. Their properties and uses are briefly explained in this post below. manufactured by blowing, flat drawing, rolling and pressing. 1. It absorbs, refracts or transmits light. It can be made transparent or translucent. 2. It can take excellent polish. 3. It is an excellent electrical insulator. 4. It is strong and brittle. 5. It can be blown, drawn or pressed. 6. It is not affected by atmosphere. 7. It has excellent resistance to chemicals. 8. It is available in various beautiful colours. 9. With the advancement in technology, it is possible to make glass lighter than cork or stronger than steel. 10. Glass panes can be cleaned easily. It is mainly a mixture of sodium silicate and calcium silicate. It is fusible at low temperature. In the fusion condition it can be blown or welded easily. It is colourless. It is used as window panes and for the laboratory tubes and apparatus. It is mainly a mixture of potassium silicate and calcium silicate. It is also known as hard glass. It fuses at high temperature. It is used in the manufacture of glass articles which have to with stand high temperatures. It is mainly a mixture of potassium silicate and lead silicate. It possesses bright lustre and great refractive power. It is used in the manufacture of artificial gems, electric bulbs, lenses, prisms etc. It is mainly a mixture of sodium silicate, calcium silicate and iron silicate. It is brown, green or yellow in colour. It is mainly used in the manufacture of medicine bottles. Properties of glasses can be suitably altered by changing basic ingradients and adding few more ingradients. It has now emerged as versatile material to meet many special requirement in engineering. solvents. Plastic may be defined as a natural or synthetic organic material which are having the property of being plastic at some stage of their manufacture when they can be moulded to required size and shape. produced synthetic resin from the reaction of phenol and formaldehyde. The resin was hardened under pressure and heat to produce useful plastic articles. It needs momentary heated condition and great pressure during shaping. When heated cross linkage is established between the molecules and chemical reaction takes place. During this stage shape can be changed with pressure. This change is not reversible. The scrap of such plastic is not reusable. Bakelite is an example of such plastic. In this variety, the linkage between the molecules is very loose. They can be softened by heating repeatedly. This property helps for reuse of waste plastic. These plastic need time to cool down and harden. These plastics are to be kept in moulds till cooling takes place completely. Bitumen, cellulose and shellac are the examples of this variety of plastics. 2. Dimensional Stability: It is dimensionally stable to a great extent. 3. Durability: Plastic offers great resistance to moisture and chemicals and hence more durable. 4. Electrical Insulation: The plastics possess excellent electrical insulating property. great extent and hence they are used as fire proofing materials. with various fibrous materials. Attempts are being made to produce structurally sound plastics. 7. Specific Gravity: The specific gravity of plastics is very low and hence convenient to handle. 8. Ductility: The plastics are not ductile and hence they fail without giving warning. 9. Fixing: Plastics can be bolted, drilled, glued, clamped or simply push fitted in position. 1. Corrugated and plain sheets for roofing. 2. For making jointless flooring. 5. Bath and sink units. 7. Decorative laminates and mouldings. 8. Window and door frames and shutters for bathroom doors. 12. Pipes to carry cold waters. Ashalt, bitumen and tar are referred as bituminous materials, which are essentially hydrocarbon materials. The asphalt is a mixture of inert mineral matter lime alumina, lime, silica etc. and a hydrocarbon known as asphaltic bitumen. In some places like Trinidad and Bermudez, asphalt is available in nature at a depth of 3 to 60 metres. It is known as natural asphalt. Common variety used all over the world is residual asphalt, which is obtained by fractional distillation of crude petroleum oil. Bitumen is the binding material which is present in asphalt. It is a hydrocarbon. It is obtained by partial distillation of crude oil. It contains 87 per cent carbon, 11 per cent hydrogen and 2 per cent oxygen. Tar is obtained in the distructive distillation of coal, wood or other organic materials. When coal or wood is heated to redness in an closed chamber, it yields volatile product and residue coke. After separating and cooling volatile product gives tar. Comparison between asphalt, bitumen and tar is guven below figure. presently, most of the commercial asbestos produced is ‘chriotile’ [Mg6SiO11(OH)6.H2O]. 1. It is flexible, soft and non-porous. 2. It is fire proof and acid proof material. 3. It is a good insulator of heat and electricity. 4. When it is mixed with cement and water, it retains shape firmly. 5. Its colour is brown or grey. 6. It can be cut into pieces or can be drilled. 7. It possesses high tensile strength in the direction of its fibres. 8. Its specific gravity is 3.10. 1. Asbestos cement sheets are the cheapest roofing materials. 2. Asbestos cement pipes are used as down take pipes of rain water from the roof. 3. With bitumen it forms good damp proof layer. 4. It is used for preparing fire proof ropes and clothes. 5. It is used as covering material for fuse and electric switch boxes. 6. It is useful for insulating boilers, furnaces etc. volatile constituent evaporates and hardened coating acts as a protective layer. It is a principal constituent of paint. It also possesses the binding properties. It forms an opaque coating. Commonly used bases for paints are white lead, red lead, zinc oxide, iron oxide, titanium white, aluminium powder and lithophone. A lead paint is suitable for painting iron and steel works, as it sticks to them well. However it is affected by atmosphere action and hence should not be used as final coat. While zinc forms good base but is costly. Lithophone, which is a mixture of zinc sulphate and barytes, is cheap. It gives good appearance but is affected by day light. Hence it is used for interior works only. The vehicles are the liquid substances which hold the ingredients of a paint in liquid suspension and allow them to be applied on the surface to be painted. Linseed oil, Tung oil and Nut oil are used as vehicles in paints. Of the above four oils, linseed oil is very commonly used vehicles. Boiling makes the oil thicker and darker. Linseed oil reacts with oxygen and hardens by forming a thin film. Black—Lamp black, suit and charcoal black. Red—venedion red, red lead and Indian red. These are the compounds of metal like lead, manganese, cobalt. The function of a drier is to absorb oxygen from the air and supply it to the vehicle for hardening. The drier should not be added until the paint is about to be used. The excess drier is harmful because it destroys elasticity and causes flaking. It is known as solvent also. It makes paint thinner and hence increases the coverage. It helps in spreading paint uniformly over the surface Terpentine and neptha are commonly used thinners. After paint applied, thinner evaporates and paint dries. 1. It should be possible to apply easily and freely. 2. It should dry in reasonable time. 3. It should form hard and durable surface. 4. It should not be harmful to the health of workers. 5. It should not be easily affected by atmosphere. 6. It should possess attractive and pleasing appearance. 7. It should form a thin film of uniform nature i.e., it should not crack. 8. It should possess good spreading power. presence of dampness while applying the primer adversely affect the life of oil paint. This paint is cheap and easy to apply. provided by it resists acids, alkalies and water very well. It is desirable to apply a coat of titanium white before the coat of enamel is applied. It can be used both for external and internal walls. 3. Emulsion Paint:- It contains binding materials such as polyvinyl acetate, synthetic resins etc. emulsion point. Emulsion paint needs sound surfaces. additives. It is durable and exhibits excellent decorative appearance. It should be applied onrough surfaces rather than on smooth surfaces. It is applied in two coats. First coat is applied on wet surface but free from excess water and allowed to dry for 24 hours. The second coat is then applied which gives good appearance. bitumen in oil or petroleum. It is black in colour. It is used for painting iron works under water. 6. Synthetic Rubber Paint: -This paint is prepared from resins. It dries quickly and is little affected by weather and sunlight. It resists chemical attack well. This paint may be applied even on fresh concrete. Its cost is moderate and it can be applied easily. darkness also. The surfaces of iron and steel are protected well with this paint. It is widely used for painting gas tanks, water pipes and oil tanks. 8. Anti-corrossive Paint:- It consists essentially of oil, a strong dier, lead or zinc chrome and finely ground sand. It is cheap and resists corrossion well. It is black in colour. Preparation of surface for application of paint is the most important part in painting. The surface to be painted should not be oily and it should be from flakes of the old paint. Cracks in the surface should be filled with putty and then with sand paper. Then primer is applied. Painting work should be carried out in dry weather. The under coats and first coats must be allowed to dry before final coat is applied. Distempers are the cheaper variety of paints in which chalk is used as base and water is used as a carrier. The emulsifying agent which is commonly used is glue or casein. Distempers are available in powder form or in the form of paste. They are to be mixed with hot water before use. The surface to be distempered should be thoroughly rubbed and cleaned. The cracks, if any should be filled by lime putty. The surface should be kept dry for about two months before applying distemper. Thus a primary coat is applied and is allowed to dry. Distemper is usually applied in two coats. 1. They are generally light in colour. 2. The coatings are generally thick. 3. They give reflective coating. 4. They are less durable than oil paints but are cheaper. 1. It should give glossy surface. 3. It should dry rapidly after application. 4. It should not develop cracks after drying. Solid and hollow concrete blocks are manufactured in factories to meet the requirements of building blocks in cities and towns. These blocks may be called as artificial stones, since they replace the stones in the masonry construction. They are manufactured with lean mixes of cement, sand and aggregates of sizes less than 12 mm. Instead of sharp edged aggregates, round aggregates are professed in the manufacture of these blocks. The properties and uses of these blocks is given in this article. 12 mm are used. IS:2185 (part I) 1983 covers the requirement, for such blocks. The blocks should satisfy the strength requirement of 4 N/mm2. Their density should be as low as possible, so that handling is not difficult. They should have sharp edges which are at right angles to each other. These blocks are used for load nearing wall construction also. manufactured. IS:2185 (part I) 1983 covers the specifications for these blocks. These block need richer mixes. Fine aggregates upto 60% and coarse aggregates upto 40% are used. right angled corners. Advantage of using concrete blocks is that the construction activity is fast. Mortar requirement for finishing the surface is less. Pointing alone is sufficient, in other words plastering is not necessary. below Table gives the differences between solid and hollow concrete blocks. walls. They are ideally suited for the construction of compound walls. 2. Flooring tiles and wall tiles. reapers. Sometimes light gauge steel or steed rods are also used as reapers. After supporting on reapers these tiles should be strong enough to take load of a man safely. The tiles should he leak proof. Normally these tiles are having curved surface having ribbed sections, so that with thin section they are sufficiently strong to resist the load. However many times flat tiles are used under curved/ribbed tiles. These tiles are not subjected to load directly. They serve in reducing adverse thermal effects. Mangalore, Allahabad tiles, and corrugated tiles are popularly used roofing tiles. Allahabad tiles are generally laid side by side and the joints are covered with half round tiles. Mangalore, Calicut, Cochin and Gujarat. 1. they should not absorb moisture more than 20 per cent by weight. 2. they should give pleasing look. 3. they should be capable of taking load of a man safely, after they are supported on reapers. 4. they should be durable. 5. they should be uniform in shape and size. 6. warpage should not exceed 2% along the edges and 1.5% along the diagonal. 1250°C to fuse them with glaze. 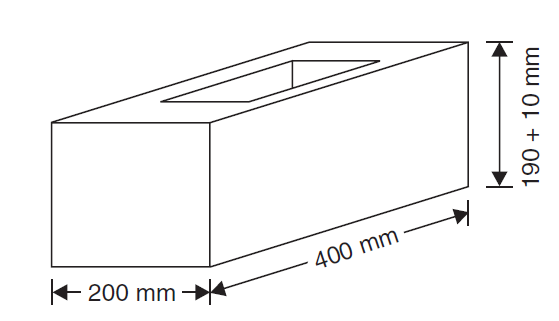 The thickness of these tiles vary from 15 to 20 mm. These tiles are flat and they have pleasing appearance. (a) Glazed Tiles: These tiles are used as finish surfaces for floors and walls in kitchen and bathrooms. These tiles are glazed and are provided with attractive colours and designs. fixing these tiles polishing is done. 1. Tolerance for length = ± 5 mm. 2. Tolerance for thickness = ± 2 mm. 3. Should be uniform in shape and colour. 4. They should be sound, hard and durable. 5. They should have very low percentage of water absorption. 6. They should give a clear ringing sound when struck with each other. 7. They should show good resistance to abrassion.